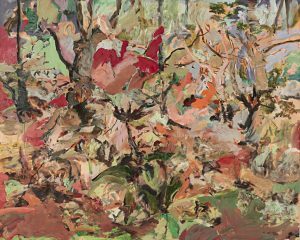 An impressive 6 meter long painting by Ismail Shammout (1930-2006) recalling the history of Palestine and the life experiences of this master of Arab modern art will lead Christie’s spring auction season in Dubai from March 15-19. Driven by emotion and passion Odyssey of a People was painted in 1980 as a result of a relentless dedicated effort of over 6 months of daily work. It is the most important and seminal work of the artist’s career and has been directly consigned from the artist’s family. 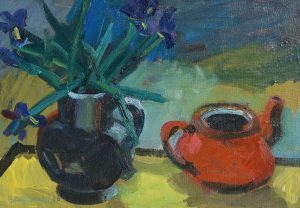 AN online only sale of Irish art is running at de Veres until February 6. It comprises 250 lots, many with estimates of below 1,000. 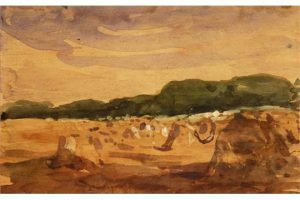 Among the 20th century Irish paintings on offer there is work by Jack B.Yeats, Nathaniel Hone, Robert Ballagh, Sean McSweeney, Pauline Bewick and Markey Robinson. The catalogue is online. Here is a small selection. 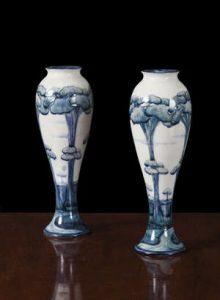 A William Moorcroft Burslem china par of circular baluster tapering slender vases sold for a hammer price of 6,000 at the January sale at James Adam in Dublin on January 29. They are stamped ‘Florian Ware, Jas MacIntyre & Co Ltd., Burslem, England’ and with Moorcroft signature in green. 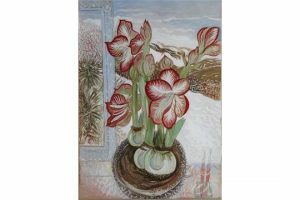 William Moorcroft was born in Burslem and trained in London at the National Art Training School. He gained a reputation as one of the leading pottery designers in Britain and was highly sought after by retailers such as Tiffanys. Moorcroft drew inspiration from the Art Nouveau movement and was fond of bold colour and Oriental form. 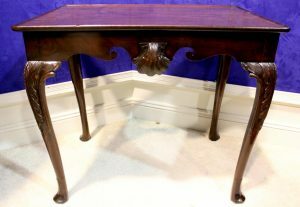 This was reflected in his work, notably in his Florian Range at MacIntyre & Co. which was extremely popular. This gave him the confidence to leave James MacIntyre & Co. and set up on his own. His departure was by no means amicable. It is reported that Moorcroft left suddenly and took many of MacIntyres employees with him. 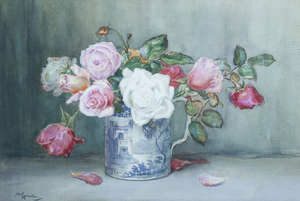 William Moorcroft was the recipient of numerous awards throughout his career including the Gold medal for his designs at the 1904 St Louis Exhibition. In 1928 he was awarded Royal Patronage by Queen Mary. Moorcroft is one of the last remaining independent art potteries in the world today. 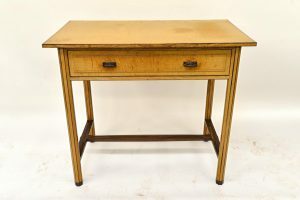 A collection of 15 lots of Cotswold School Furniture will come up at Bellmans Auctioneers of Winchester on February 14. Estimates range from £100 to £8,000. 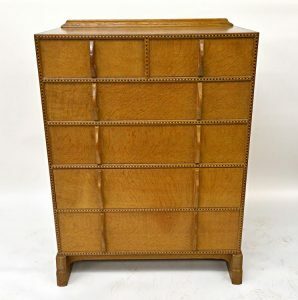 Most were made by Peter Waals (1870-1937) in the tradition of Ernest Gimson at his workshop in Chalford in Gloucestershire between 1922 and 1936. 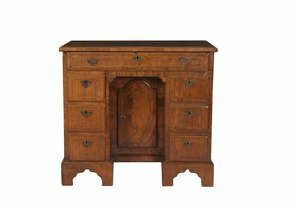 Furniture by Waals was widely collected by some of the leading English industrial families of the day like the Cadbury’s and the Pilkingtons. 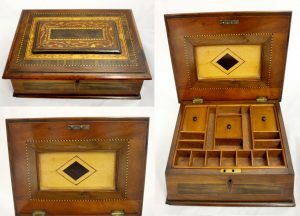 These pieces are from Lyndwood, Stoughton Road in Leicester, former home of the Goddard family who patented silver polish in the 19th century. 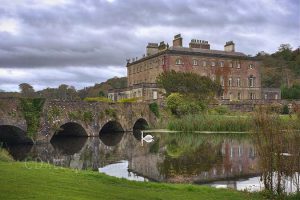 One of the best known stately homes in Ireland, Westport House, has been sold to the Hughes family, which operates the Hotel Westport in Co. Mayo. They say they are committed to ensuring the property is given the attention and care it deserves. They plan to spent 50 million on refurbishment and upgrading works. Mayo County Council has acquired 40 acres of the estate. The purchase price was not disclosed. Westport House had been on the market with NAMA with a price tag of 10 million. The original house was built in the 1650s by Colonel John Browne on the foundation of Grace O’Malley’s Castle. He married O’Malley’s great great granddaughter, Maude Burke. The current house which dates largely to the 18th century was designed by Richard Cassells who also designed Leinster House and Carton. It was completed by the renowned English architect James Wyatt, who also planned the layout of Westport town. It has been the ancestral home of the Browne family for generations and was the first stately home in Ireland to open to the public in 1960. Since then it has welcomed more than four million visitors. A rare example of a large-scale animal study by the Flemish painter Sir Peter Paul Rubens achieved $5.1 million at Sotheby’s sale of Old Masters in New York. A rare example of a large-scale animal study by the artist, Study of a Horse with a Rider had been until recently described as by a follower of Sir Anthony Van Dyck. However, the authorship had been difficult to discern due to overpaint and background added later, which dominated the original scene. With the removal of these later additions, the canvas has been revealed as a work of high quality, and a typical example of the spirited and rapidly-painted oil sketches for which Rubens is celebrated. 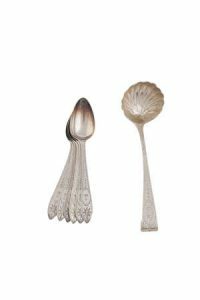 SET OF SIX IRISH BRIGHT CUT ENGRAVED SILVER TEASPOONS, Dublin 1894, together with a similar small Irish silver scroll end soup ladle, Dublin 1896 (80-120) UPDATE: THESE SOLD FOR 120 AT HAMMER. 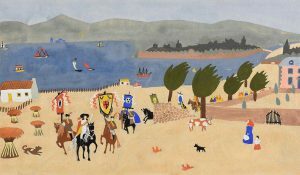 The single-owner sale dedicated to the collection of Ed Cohen and Victoria Shaw at Sotheby’s in New York on March 2 is largely focused on Post-War and Contemporary Art. 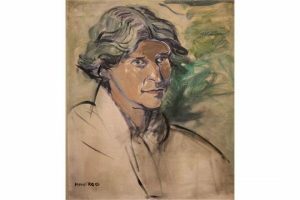 Entitled In Its Own Light the auction includes examples of German Expressionism and Modern British art. 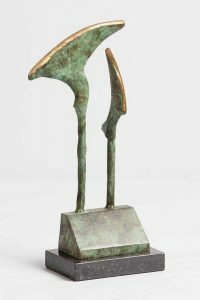 The New York couple’s collection was created over 35 years and reflects the close relationships (often grounded in a shared passion for literature), between Ed Cohen and many of the artists represented, as well as with gallerists such as Anthony d’Offay and Marian Goodman. 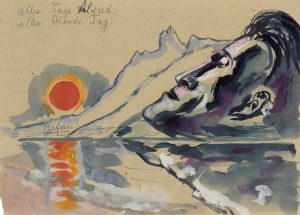 Highlights include pieces by Joseph Beuys, John Currin, Cecily Brown, Brice Marden, Anselm Kiefer, Agnes Martin, William Kentridge and Gerhard Richter. 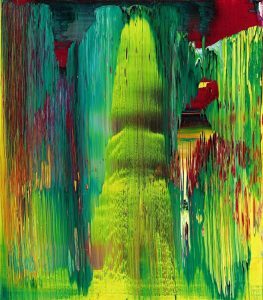 Richter was collected in particular depth with a range of works – from a smaller-scale example of the artist’s signature abstraction, to examples from the important, but less well-known Souvenir and Painted Photograph series. 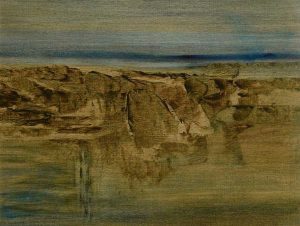 Allan Schwartzman, Chairman, Sotheby’s Fine Arts Division commented: “The Cohen Collection defines collecting at its best, as it includes the highest level of selectivity and connoisseurship, a very personal and finely honed assembly of artists spanning many generations, and an articulate and unwavering commitment to the most timeless of subjects for art—the human condition. 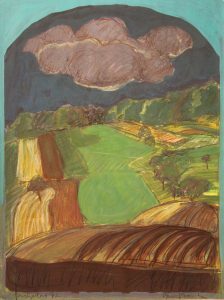 Whether with artists collected in depth, or represented by a single work, the Cohens have consistently collected works that get to the heart of each artist represented, not always in the most obvious way, but always in the most insightful.” Ed Cohen is also known as a generous supporter of a number of museums, most notably the Tate where a gallery is named for him. 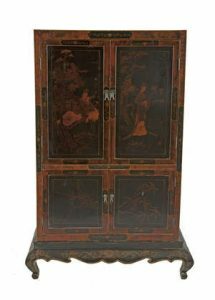 The sale is estimated to fetch $4/6 million. It will be followed by the contemporary curated auction. 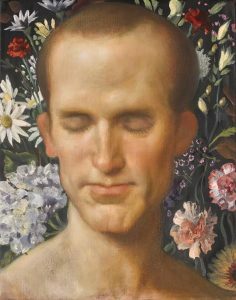 Both sales are timed to coincide with The Armory Show, with exhibitions opening on February 24.